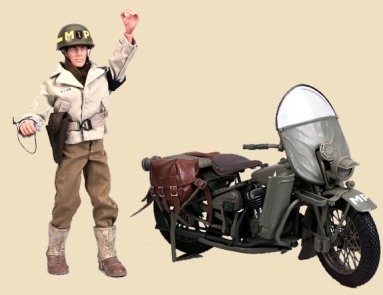 © Copyright 2000 HASBRO, Inc.
Hasbro continued it's Harley Davidson motorcycle line in 2000 with this US Army Motor MP featuring a nice Military Police motorcycle and rider. 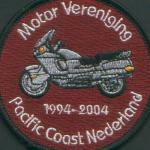 The motorcycle featured a movable gearshift lever, springer seat, active springer front end, working kickstand, working rear stand, left and right saddlebags, leg guards, windshield, and a black display base. The figure featured a standard classic collection body with a light green jacket, olive drab trousers, scarf, removable MP armband, .45 caliber pistol, web belt, boots with molded leggings, whistle, MP helmet with 1st division insignia, and dog tags. carded figures with the molded colored T-shirt. The Humvee was sold at all toy retail markets. Retail price was a whopping $99.99, but went as low as $49.99 during sales at Target. © Copyright ? HASBRO, Inc.
Hasbro's Harley Davidson motorcycle release for 200? was this Electra Glide featuring the Metropolitan Police markings. The bike featured working center and side stands, working steering column, siren, detailed gauges, footboards, engine guards, saddlebags, emergency lights and radar guns. It also included an exclusive G.I. 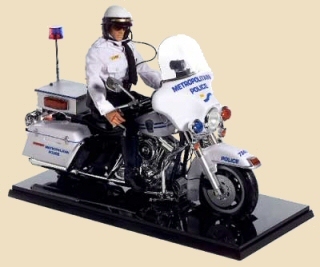 JOE police officer action figure with shirt, breeches, high-top boots, motorcycle helmet, sunglasses, necktie, dog tags, duty belt, handgun and radio communications.